It was Tami from Vegan Appetite who first brought to my attention the difference deep frying makes to the flavour of tempeh, but my recent trip to Indonesia took the love up a few notches. If you’ve ever been unsure about tempeh, this could just be the recipe to change your mind – I know multiple people who will happily eat this but generally eschew fermented soy under any other guise. The method here transforms tempeh from bitter (which, incidentally, it isn’t at all in Indonesia) to sticky-sweet bliss in next to no time at all. The galangal imparts its unique earthy pine flavour, which to me is what makes this dish what it is. Some tempeh is better than others, so if you find upon mixing it into the syrup the tempeh breaks into a billion tiny pieces then don’t worry. The dish will still taste just as good and once the mixture dries it will stick together in clumps anyway. Like with most of my recipes, there’s room to screw up a little. A little bit more or less of any ingredient isn’t going to cause disaster, and if you want to spice things up then add some fresh chili into the mix. The coriander also isn’t necessary, but I like its mild lemony flavour – for best results toast some coriander seeds and grind them into powder, but you can also use 1/8 to 1/4 teaspoon ground coriander if that isn’t an option. Line a large plate with a few layers of kitchen roll. Heat a few inches of oil to medium high in a wok and begin to fry everything in batches, starting with the tempeh. Remove from the oil and drain on the kitchen roll when it browns lightly and becomes crispy. Turn the heat down to medium and fry the shallots next, until lightly browned and crispy. Remove onto the paper towels. The garlic goes into the oil next. As soon as it begins to brown, remove it from the oil immediately. Lastly tip the peanuts into the oil and fry until they are a few shades darker. Drain. Heat the tamarind water, palm sugar, galangal, salt, and coriander to a saucepan until the sugar is melted and the liquid is bubbling. Leave for a couple of minutes and tip in all the deep fried ingredients and stir quickly to combine. Allow the tempeh to cool a little before serving (it’s texturally best once it’s completely cooled, or even refrigerated). I don’t even like nuts and I want this right now. Looks incredible, Kip! Galangal is integral to SE Asian cooking. You can technically do this recipe without it, but it wouldn’t be the same at all! great post ^ ^. 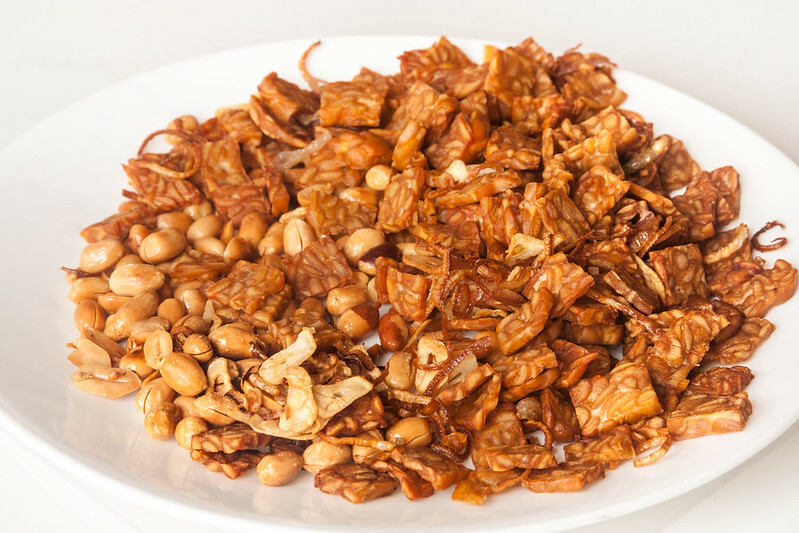 By the way, you can substitute the tempeh chips with potato crisps and you can use powdered galangal (if finding fresh is difficult) or finely shredded one (this way you’ll need less galangal in the recipe). For less bitter smell, kaffir lime leaf can be added. Thanks for the tip! A lovely woman in Ubud made this with a combination of potato and tempeh and it was delicious.